The KSO throws its 2nd annual Bourbon Barrel Ball to fund Free concerts in Parks and area Schools. 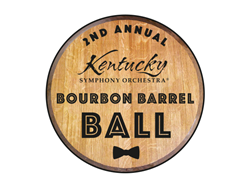 Linking savory Kentucky spirits with tasty nostalgic music has become an annual event with the Kentucky Symphony Orchestra’s 2nd Annual Bourbon Barrel Ball — 6:30 p.m. Saturday, April 27th. The KSO’s party with a purpose marks the orchestra’s 25th fundraiser, supporting its annual free education and park concerts. This year’s event will be the first held amidst the bourbon at New Riff West Newport warehouses, tasting & bottling facilities (which formerly housed the Greenline bus & trolley system till 1972). rickhouses and bottling facilities. A scrumptious 3-course, duo-entree dinner by McHales follows including wine and dessert. The KSO Big/Boogie Band offers the perfect bourbon/music mix — a Rat-Pack Redux set (Frank, Dean and Sammy at the New Riff) — “Come Fly With Me,” “That’s Amore,” “The Candy Man”... and a Dazzling Divas (R&B Royalty) tribute set — Natalie Cole, Aretha Franklin, Whitney Houston, Patti LaBelle... (see full playlists attached). Dancing, music and conviviality continue till the last pour. Live, silent and on-line auctions feature destinations, sports and entertainment tickets, dining options and much more. The evening’s big raffle drawing features the rarest of bourbons — O.F.C. (Old Fashion Copper) 1985 from Buffalo Trace. Only 61 bottles were retrieved from this 34-year vintage barrel. $50 per chance / up to 500 sold. In addition the KSO's tasty select single barrel bottles (112 proof) are for sale, on-line and at the event (limited Inventory). "The KSO has always thrown great parties, but this is a 4D Clam-Bake!" exclaimed KSO founder James Cassidy. "Smell the angels' share, check out the players and ring a dings, listen and dance to the Rat Pack and Divas, and taste the bourbons and fancy foods." Proceeds from the event keep the music playing across the region. The KSO has performed free education concerts for 239 regional schools and 138,837 students over the past 24 years. Additionally free annual summer concerts in Covington’s Devou Park have brought nearly 388,000 area residents to the iconic concert bowl in 24 summers. The “Bourbon Barrel Ball” provides funding to keep these vibrant, educational, engaging & entertaining opportunities available for residents of Greater Cincinnati. Can’t attend? Support the KSO’s outreach programs by buying raffle tickets or bidding on auction items on-line. Beginning on April 16th, patrons may preview and bid on auction items on-line. Bidders have the opportunity to place absentee bids if they can not attend on April 27th. (raffle tickets available on-line; winner need not be present to win). Call the KSO today and make your reservations (deadline— April 23) for the KSO’s Bourbon Barrel Ball: (859) 431-6216 or visit kyso.org The full evening with reserved seating, cocktails, bourbon tasting, dinner, wine, dessert, dancing / live entertainment is $125 per person ($50 is tax-deductible).